Fabrice Hyber (born Luçon, France in 1961) is one of the most inventive and influential artists of his generation. Working across painting, drawing and installation, each work he makes is developed in response to another, becoming part of an interconnected non-hierarchical series. BALTIC Centre for Contemporary Art, Gateshead presents the artist's first large-scale solo exhibition in the UK. The exhibition brings together more than thirty works spanning the last twenty-five years, from the iconic early self-portrait Sans titre (autoportrait) 1989, to several new commissions such as Trans parent 2012, a painting visitors experience by walking through layers of the pictorial plane. Since the 1980s Hyber has created works using an extraordinary array of materials based on a network of unexpected sources and associations. He is perhaps best known for his Prototypes d'objects en Fonctionnment (Prototypes of Working Objects, or POFs). Begun in the 1990s, they playfully shift the function of everyday objects. Visitors to Hyber's exhibitions are invited to experience these works directly by interacting with them. For Hyber âa work of art is a beginning of a sentence that is not completed' without the audience. Hyber's work is characterised by experiment and exploration. 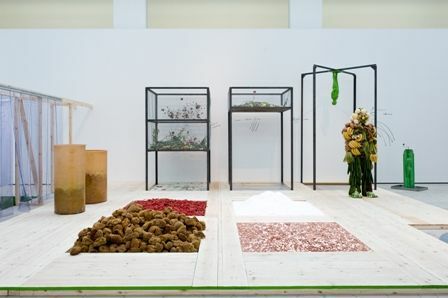 At BALTIC the artist composes a new universe through his drawings and prototypes - his âraw materials'. The exhibition includes both old and new works brought together in new configurations. Exploring the intricate and typically playful processes of transforming materials, it is constructed as a landscape evocative of a spa or salt marsh. Organised around a number of modules, pools and sheds contain raw materials including foodstuffs, money and natural elements which are all subject to transformation. Visitors are invited to this âmental spa' to interact with the works directly, opening huts such as a wind house to liberate the elements within. When activated, the exhibition is designed as a living organism that takes over, altering traditional behavioural responses within a gallery environment. Hyber uses the occasion to question Gilles Deleuze definition of an exhibition: âAn escape into the imagination or art means producing reality, creating life'. The exhibition was originated by and first shown at Palais de Tokyo, Paris where it was curated by Akiko Miki.